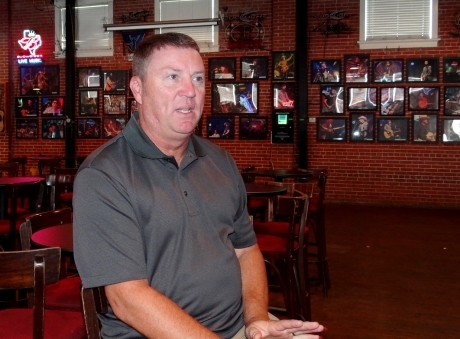 Photo - Banita Creek Hall owner Kevin White gives an interview for receiving the Nacogdoches County Chamber of Commerce Gary Justice Business Excellence Award - Medium Business of the Year. Banita Creek Hall, a Nacogdoches treasure! Every town or city wants one…NACOGDOCHES HAS ONE! A place to meet and enjoy the company of friends and family and outstanding music and talent! That place is Banita Creek Hall. The Nacogdoches County Chamber of Commerce is proud to name Banita Creek Hall as the 2016 Medium Business of the Year. The Business of the Year Award is sponsored by Regions Bank. Banita Creek Hall, which occupies a former cotton gin building built in 1907, has become one of Texas’ top music destinations. It is also attracts folks from all over to come and enjoy music and company of others! The business started in 2000 and then purchased by current owner Kevin White in 2008. White says that the secret of Banita Creek Hall success is the outstanding staff; the talent of the performers and the wonderful customers that journey from across Texas and neighboring states to enjoy this wonderful entertainment experience. On Thursday nights, Banita Creek Hall offers free country dancing lessons. Students from Stephen F. Austin State University conduct the classes. The business is fortunate to have several key and veteran employees. White credits much of the success of Banita Creek Hall to his staff, which includes Kitzi Souza, Head Bar Tender and his wife, Beth, who serves as the administrator and payroll agent. Banita Creek Hall currently employs 18 to 20 individuals, many of them college students. White is proud that he retains so many of his employees. He said that a major reason for them staying is their love for country music. Banita Creek Hall has also become a meeting place for community groups and individuals. They have hosted weddings, service organizations and non-profit organizations. A great business model, outstanding employees, talented entertainers and the right place, Nacogdoches, Texas! The Nacogdoches County Chamber of Commerce is proud to name Banita Creek Hall as one of the 2016 Gary Justice Business Excellence Award recipients. The Nacogdoches County Chamber of Commerce 95th Annual Meeting and Membership Banquet begins at 6 p.m. on Tuesday, Sept. 27, in the SFA Grand Ballroom. The 2016-2017 board of directors will be inducted and award recipients will be recognized. Charlotte and Gary Lee Ashcraft, Citizens of the Year - award sponsored by Tipton Ford-Lincoln. The Hospice of East Texas Shop, Small Business of the Year - award sponsored by Heritage Land Bank. Banita Creek Hall, Medium Business of the Year - award sponsored by Regions Bank. Nacogdoches County Peace Officers, Large Business of the Year - award sponsored by R&K Distributors, Inc. Bronze sponsorships are available for $750 and include corporate recognition and seating for eight or nine. Individual admission tickets are available for $40. Contact the Chamber at (936) 560-5533 for reservations. Seating is limited, and the reservation deadline is Sept. 13.